Jean passed away peacefully at the Beausejour Hospital on Monday, November 26, 2018 at the age of 91. She was predeceased by her husband Ted in 1995. She leaves to mourn her passing her children Joan (George) Kowalchuk and Ron (Valerie). As well, she will be remembered by grandchildren and great grandchildren. Thank you to the Beausejour Hospital and staff as well as the staff at Stoney Plains for all the care and compassion they showed towards our mother. Funeral Liturgy will be celebrated on Friday, November 30 at 11:00 a.m. at Sobering Funeral Chapel, 1035 Park Avenue E., Beausejour with interment to follow in St. Mary Parish Cemetery. In lieu of flowers, donations in Jean’s memory may be made to the Beausejour Hospital T.V. Fund. Our deepest condolences on the loss of your mother and grandmother. Steve and Eleanor Nazarewich. Sorry to hear of your Mom/ Grandmothers passing. May all your memories bring comfort, you are in our thoughts & prayers. Our condolences to Joan, Ron and their families. I spent time with the family years ago while they visited at Easter and Christmas with my sister Lilly and brother in law Stanley. Rest In Peace, Jean. 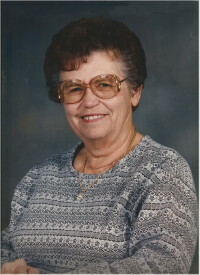 Jean was a long time resident on their farm on Sand Hill Road, north west of Beausejour. She was almost always smiling. A really nice lady. Joanne, thinking of you at this sad time in your life. Hopefully, the wonderful memories of your pleasant and loving Mom will see you through the mourning period. Ron, Joan and families, our deepest condolences on the loss of your mother and grandmother. She was a great lady. She will be missed in the community. Sorry, we can’t make the funeral. We would like to express our sympathy to you on the loss of your mom. May she Rest In Peace. Condolences to all the family .